I must say that one thing I’m loving at work at present, though I’m not sure how many others do, is that we are making an effort to ‘dress up’ for certain events. And yes, even though Halloween is nothing like as big here, as it is in the US (or so I’m told, closest I got was flying home on 30th, but shops were full of stuff), it seems we can get to dress up in ‘scary’ outfits to celebrate the day this year. Thing was for me, what to dress up as, for Halloween. Yes, the chances of me not getting involved were miniscule, lol, given I love this sort of thing, and if people dont support it, it wont continue. And no, however scary some of the movie robots might have been, they dont really count as Halloween, lets face it. appeared, and yes, purchase has been arranged. There shortly will be two of us looking for a suitable dress, in my size to match. Oh, and if anyone knows of a broomstick, that actually flies, I’d love one, especially as First Buses went absent without leave again on Monday night! Perfect for Halloween, but I might be tempted to use more often, if one truly existed, lol! As stated, the need for make up, to make me into a hideous witch, might not be critical! Ability to cast magic spells, purely optional, though might be fun! Right, video time, something very silly, from the Muppets! Author stevielounicksPosted on October 16, 2018 Categories Bradford, First Buses, Halloween, Huddersfield, Muppets, Vampires, Witch2 Comments on Which outfit for Halloween? I am a silver machine? Oh fine, I wish! Irony is, we are apparently doing a dress up day at work on Halloween, and if I thought I could find (suspect I know where it is, actually), and more critically could still get into one of my robot suits, then yes, I’d be tempted to wear one for the day. Not that I could wear a Cyberman helmet (later addition) to the outfit in a call centre, but besides that… I might yet see if I can afford to try and find a nice witch outfit for the day, though sadly I suspect I will have to rely on First Buses to get me to work, not a broomstick, and no, I dont think I would be wearing the Witch outfit on the bus, anyway! Well, I could just try and find a metallic silver cape, and hood, and do the robot thing, because… I have an Ebay account, but very rarely use it. I know you can get quite a lot on ‘buy it now’ nowadays, just like a shop, but rarely buy anything nowadays, due to a minor issue called lack of funds. Thankfully, no one bid for it, the seller put it back on the market again, and I grabbed it yesterday evening, which meant I got to bed about midnight by the time I’d sorted that out, and done everything else. But yes, its heading my way. Fine, you want to see it, I hope? I know, shows a bit too much flesh in the chest area for a robot, so I either need to find a metallic silver top, or cape, or something, ideally. Oh, and a silver hood would be nice, lets face it, but not sure I can afford all that! But yes, fine, the inner robot won out, lol! Not quite sure when I wear it, but I’m sure I will sometime soon! Halloween, maybe, but probably not without accessories, which I cant afford, lol! And yes, you’re right, probably wont buy on Ebay until I get my next voucher in a few months! Right, video time. I have no idea who the lady is in this video, but consider this, if still alive, she’s probably a pensioner by now! Well, I’m 60, and was 14 when this was made, and I’m assuming she was at least 18, so…? But yes, if anyone actually wants to turn me into a silver machine, please let me know! Author stevielounicksPosted on October 9, 2018 Categories Cybermen, Ebay, Fashion, Halloween, Hawkwind, robot, robot suit, WitchLeave a comment on I am a silver machine? A chance to dress up? I know, I know, its a bit early for Halloween, but I was short of material for tonight, and someone on one of the Forums asked about people’s dressing up plans for the big night, which inspired this. Its fair to say that in the US, Halloween is a massive affair, and has been, for as long as I can remember. Here in the UK, not the same. Indeed, when I was young, I think the whole event barely happened over here, let alone to any major degree. Nowadays, it is a bit bigger over here, but still not in any major way, compared to the US. I’ve only ever once seen the build up to it in the US, 2 years ago, and thats as close as I’ve got. 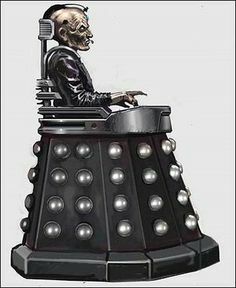 Currently, given the state of my back, and stuff, the safest, scariest look I could probably do for Halloween, would be Davros, of Daleks fame, though I’ve no idea if that era of Dr Who really caught on in the US? But yes, a look like this would definitely be something I’d love to do for Halloween! And yes, this year, I could do it, if anyone wants to design something, as it is a non working day for me, being a Tuesday! Maybe some day I will get to experience the full US Halloween thing, though I’m not quite sure when! But yes, if I did, I would so want to dress up myself! The video? Well, I couldnt think of anything really suitable, so by slipping the flapper idea into the blog, I’m going to use this! So 1920’s darlings! Author stevielounicksPosted on October 12, 2017 Categories Davros, Dressing Up, Flapper Look, Halloween, Metropolis, Petula Clark, robot, Temperance SevenLeave a comment on A chance to dress up? Oh fine, before anyone gets too excited or anything, it was just a little prick for a blood test. OK, fine, this old lady might have quite enjoyed a vampire biting her on the neck, and all that, but no, far more boring lol! Nor did they inject (to my knowledge) any secret transforming serum into my body either. So fine, all in all, a bit of a let down lol! One thing I’ve never done, or at least remember ever doing, is dressing up for Halloween. Principally because its never been the same big event over here that it is in the US, and even now, when a few do dress up at least, it certainly didnt happen over here about 50 years ago, when I was young! So yes, I sort of feel like I’ve missed up on all that dress up fun, and its not likely to happen now. The only time I’ve even been close to a proper Halloween was 2 years ago, when I was in LA until a few days before the big event, but thats as good as its got. And yes, over there, I’m pretty sure that even as an adult, I could have got in on the dressing up fun, if I’d been so inclined. So, no the blood test didnt involve the blood being taken from my neck, by any means. Just a needle into a vein, near the elbow, and plenty of blood removed, and that was it! What a letdown lol! Results in a week or two, though I’m not expecting to be told I’m a vampire, somehow! Yes, this is the night when supposedly this world, and the spirit world come closer for one night. For those of us of Irish ancestry, we call it Samhain. To Americans, its better known as Halloween. I’ll be honest, I have no idea what Halloween in the US is like, I’ve never been there at that time of year. Though to be honest, in recent times, the event seems to have taken off in a similar way over here, so I guess I now have an inkling of what it must be like. Of course, that means I never got to dress up as a witch, or the like when I was young, we never celebrated it. Fireworks night, 6 days later, is a whole different matter! Of course, apart from putting on a warm coat, you never got to dress up for that! Mind, the need to dress up today over here, was a moot point. I went out this afternoon in nothing more than a sleeved top (not sure I even needed the sleeves) and trousers, the temperature was nearly 70, at the end of October! Seriously, normally, somewhere in the 50’s would be quite good for now! Mind, we will probably pay for it very soon. Its funny, its pretty much a non event over here, we might get one, maybe two callers tomorrow evening, but that will really be about it. In my ancestral home of Ireland, its called Samhain, but even over there, its not a major event. But from what I’ve heard and read, in the US (possibly Canada as well?) halloween is a major event in dressing up, going out trick or treating, the whole works! I dont know more, never having been there at this time of year. Though at my age, maybe the skirt should be a little longer lol? As you might have guessed, I’ve never dressed up for halloween, well not that I can remember anyway. Maybe as a small child I did, but really cant remember my parents ever doing anything like that. I might have done if offered an outfit like that, but given that I hadnt cottoned on to my robot nature at that point, probably not lol! A blessed Samhain to all my readers, have a wonderful halloween evening in the US, if you are doing anything special tomorrow night. The video, something very ethereal, very Irish, and suitable for this occasion. At least, I hope it is.